Gorgeous, gorgeous cover. Her skin looks radiant against the blue. When I saw this cover I knew I wanted to incorporate it into Tsuki no Ai’s layout. 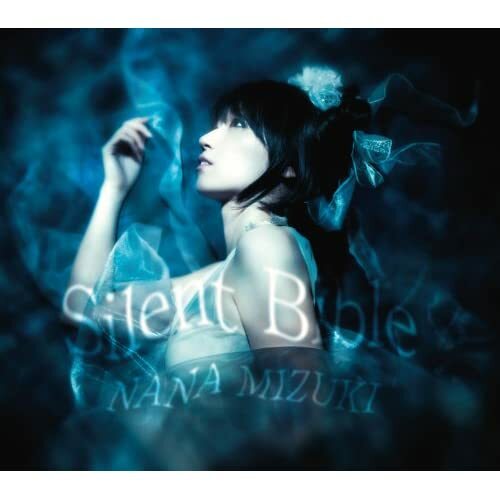 Silent Bible takes us back to Nana’s anime/seiyuu roots (think Justice to Believe). The song is quiet at first, with just piano and quiet synth. The sad and longing melody presented in the introduction continues throughout the rest of the song, but at a faster pace. Strings are present in this song, as they are in most of Nana’s songs. Overall the song is catchy and passionate, one of Nana’s best. Polaris has an interesting title as well as an interesting musical concept. Nana’s actually doing something of an R&B song. I’m not used to hearing her voice against R&B instrumentals or at this particular pace, but that’s not to say this isn’t a good song. All in all I prefer the anime-ish songs, but this shows that Nana is more than just a seiyuu turned musician. Nana Mizuki is a musician in her own right… no anime necessary. UNCHAIN∞WORLD begins with some heavy guitar riffs, but the song incorporates an anime feel during the verses and chorus. This song is high energy and full of power. While thus far all three songs have used minor themes, it doesn’t keep the songs like UNCHAIN∞WORLD from being enjoyable. Undercover sounds like something that belonged on her previous single, PHANTOM MINDS. Here’s where we use a more major key (though not happy-go-luck of course). The strings in the song kind of give me an Irish vibe for some reason. The song is well-orchestrated and wraps up the single nicely. Overall: Nana has really been delivering in her singles lately. While most seiyuu artists can only find sales within an anime niche, Nana Mizuki has proven that she can last as a Jpop singer without relying on her popularity as a seiyuu. You are currently browsing the archives for the Nana Mizuki category.